My mother stayed in Ashton Hall. It was good initially. When my mother first moved there she resided on the independent living side, which I questioned because she had always lived on the assisted side and she ultimately had to transfer back to the assisted side. It's a larger facility and they changed staff members a lot. They had a high turnover rate for the staff members and it was expensive. The rooms were a lot bigger. With the independent side, the rooms were like apartments. On the assisted side, it's more like suites, but the rooms were still bigger and they had companion rooms as well as larger suite type rooms. The assisted living side did not have activities, but the independent side had more. I was told that they had activities, but my mother told me that they didn't. There were times that I would be there during the day and I did not see any activities happening. It's a very nice facility though. Ashton Hall was really nice and they were really helpful. They gave me a lot of information. Everyone seemed really friendly and happy. Just looking at the residents, you can tell what kind of care they're getting. I didn't taste the food, but it looked good. We're ready to move in to Ashton Hall whenever they have something. It was very pleasant. It's an older place, but it's well kept and we liked the way we were received by the people. We loved the rooms, which were larger than usual. The price was in our budget, so we decided to submit a downpayment. They have games, outings, and the usual things. The staff showed us what we needed to know. I wasn't happy with the first person who greeted us, however, but she wasn't the one who gave us the tour. The best way to get to know a community is by scheduling a tour. See the facilities, meet the staff and residents, and get a feel first hand what it's like to live at Ashton Hall Assisted Living. Here at Ashton senior living we understand that it can be difficult to choose what senior living community for someone to call home we have spent about 20 years creating an environment that our residents can call home, the McGill family owns and operates the facility is always on site. For our residents who need independent living, we have a new three story building that offers seven different floor plans, all floor plans come with stainless steel appliances and granite counter top kitchens. Our independent living residents are also able to eat three meals a day in our alluring community dining room. For our residents who need assisted living we offer options to you loved one, assisted living level one offers assistance with personal, housing, or supportive services. 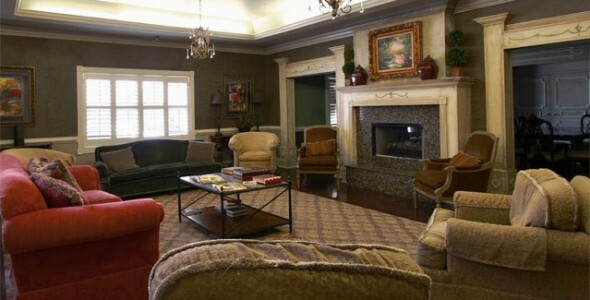 Assisted living level two offers housing for seniors with Alzheimer's and dementia. We offer many services to our residents here at Ashton, Our independent living residents are offered furnished rooms with handicap accessible bathrooms, each room has individual air and heat controls. Laundry services and weekly housekeeping. All utilities are included along with cable and telephone services. Assisted living level one provides protective care for our residents who need a close eye to be kept on them, assisted living level two has specially trained staff who give our residents with the love and respect they deserve giving each resident the individual attention they need. Be sure to consider becoming a McGill extended family member among your options when considering independent or assisted living.